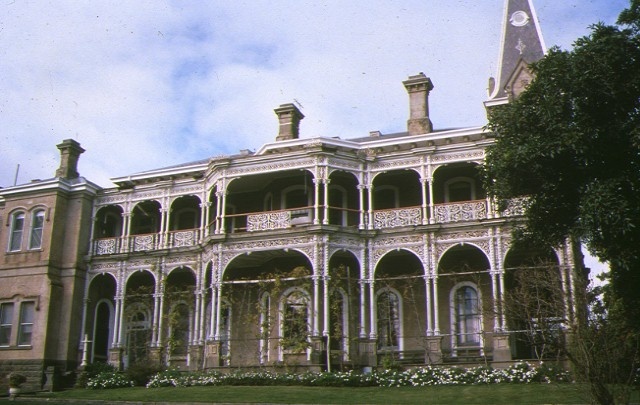 Rupertswood Mansion built for Sir William Clarke at Sunbury in 1874-76 was one of the largest houses built in Victoria in the nineteenth century. It is located within the township of Sunbury, 35 kilometres west of Melbourne. The foundation stone for Rupertswood was laid on 29 August 1874 with some 1000 people in attendance. The mansion was built by contractors George Sumner & Co. from designs prepared by architect George Brown, whilst interior decorations were carried out by Schemmel and Shilton. The two storey bluestone mansion, surmounted by a 100 feet high tower with a mansard roof and widow's walk, was completed in 1876 and described at that time as being in the "Byzantine order of architecture". The ballroom was added in late 1881 and completed in 1882. The elaborate gates and lodge were built at the same time as the main house to designs by the architect George Brown. The stables with clock tower were destroyed by fire in 1928. The gardens and parkland, including the artificial lake, were designed by the leading landscape architect of the time, William Sangster. The brick and cement tank, capable of holding 9000 gallons of water, supplied water to the house and grounds. The property was sold by the Clarke family in 1922 to manufacturer Hugh Victor McKay. The pastoralist William Naughton bought Rupertswood in 1926 and the property was subdivided. Since 1927 Rupertswood has been owned by the Salesian order. The Salesian Society, an order of Catholic priests and brothers, dedicated to the care and education of young people, has approximately 17,000 members worldwide. The order was founded by St. John Bosco in 1859 at Turin, Italy, who called his congregation the Society of St. Francis of Sales after the 16th century saint, and the priests and brothers are known as Salesians. Rupertswood is of historical, architectural, aesthetic, and scientific (horticultural) importance to the State of Victoria. Rupertswood, one of the largest houses built in Victoria, has historical significance as an expression of an extraordinary way of life based on great affluence. Rupertswood became one of the principal social centres in Victoria, with hundreds of guests arriving at the estate's private railway platform to attend hunt meets, balls and house parties. The railway platform has been re-built probably in the mid twentieth century but the site is part of the significance of the place. The estate also had its own half battery of horse artillery when Sir William Clarke formed a small permanent force in 1885. The drill hall and the vault remain as reminders of this privately sponsored regiment. Rupertswood has important historical associations with landowner, stud-breeder and philanthropist Sir William John Clarke (1831-1897). 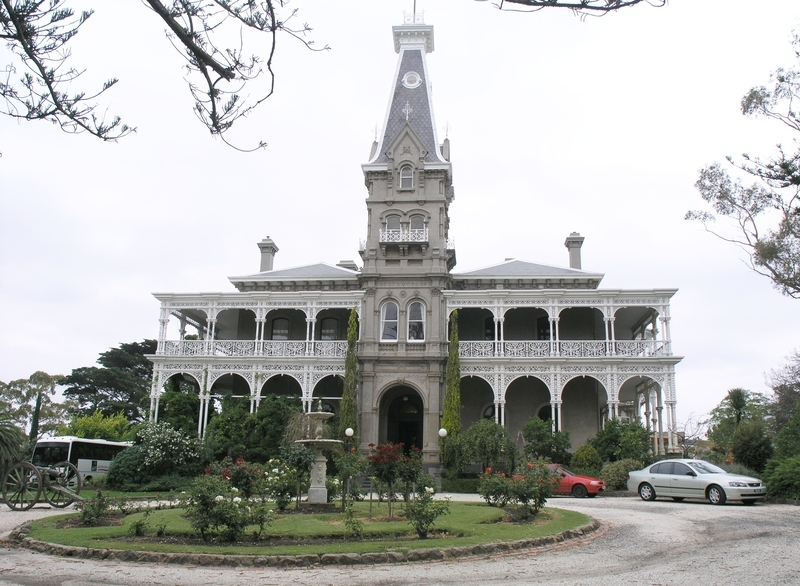 The elaborate mansion with its large estate demonstrates the important status of Clarke whose prominence as a colonist was recognised in 1882 by his appointment as a baronet. Rupertswood has an historical association with Hugh Victor McKay (1865-1926) who owned the Sunshine Harvester Works, for many years the largest factory in Australia. McKay achieved his long-held ambition of owning Rupertswood in 1922 but died after only four years. Rupertswood has significant historical associations with the Catholic Church in Victoria. The Salesian order of priests, who have occupied the property since 1927, was formed in Turin, Italy by Saint John Bosco who set up schools and homes for the underprivileged of the city. The order arrived in Australia in 1923 and priests and brothers were welcomed in Melbourne by Archbishop Mannix in 1925. From 1931 to 1981 Rupertswood was the site for Eucharistic Festivals, the major annual devotional event of the Catholic Church in Victoria. The ballroom was converted to a chapel and a choir loft was added in 1964 by the Salesians. Rupertswood is of historical significance for its association with the history of cricket as the birthplace for the Ashes, cricket's most illustrious trophy. After a social match on the property with members of the English touring cricket team in 1882, Janet, Lady Clarke burnt a bail and presented the ashes in an urn to the victorious English captain, Ivo Bligh. Rupertswood is of architectural significance as an extraordinary example of a mansion built to reflect the wealth and prominence of the Clarke family and designed by architect George Brown in an eclectic design. Rupertswood is of architectural and aesthetic significance for the outstanding craftsmanship and decoration of the interior. The stained glass windows by Ferguson and Urie are particularly noteworthy. Rupertswood is of aesthetic significance for the garden and parkland designed in the picturesque style by William Sangster in 1874. Despite the loss of much of the plantings and some of the pathway system the garden retains elements from the original design such as the entrance and lodge, drives, lake and rockery, the Kept Gardens around the mansion, the escarpment, remnants of the water supply system, the household produce garden and the farm. The gardens are of scientific (horticultural) significance. There are two rare Afrocarpus falcata, unusual wisteria cultivars, camellias and conifers, especially Bunya Bunya Pines and Hoop Pines which have grown to a large size and are an important landscape feature. Rupertswood, Macedon Street, Sunbury, Hume City Council. 2. All the land L1 described in Certificate of Title Volume 5416, Folio 006 and Certificate of Title Volume 3475, Folio 982 and part of the railway reserve marked on Diagram No. 275 held by the Executive Director, Heritage Victoria. The main significance of Rupertswood lies in the mansion and its garden, and its surviving early building fabric, exterior and interior. The interior features of the whole residence which demonstrate the occupation by the Clarke family are of particular importance and should be protected. The whole of the Rupertswood grounds is of importance as a rare surviving estate designed by noted landscape designer William Sangster in the Picturesque style and should be retained. The site of the railway platform is of importance to the understanding of the place and should be protected. 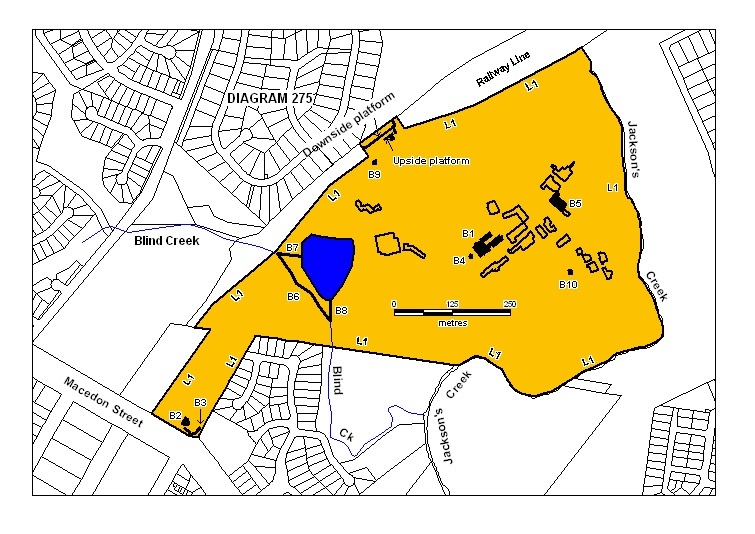 The Rupertswood Garden Conservation Management Plan (2004) prepared by Meredith Gould Architects should inform the permit policy for the garden.